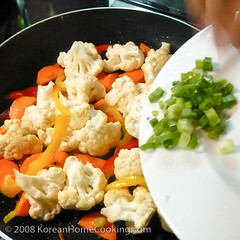 Cauliflower became known to Koreans probably less than ten years ago. When new ingredients are introduced to a different culture, our moms ingeniously come up with what looks like an authentic delicious home-style dish and yet a totally new addition to our diet. I learned this recipe from a Korean family I used to live with in my first year in New York. The family was visiting the US for one year from Korea. 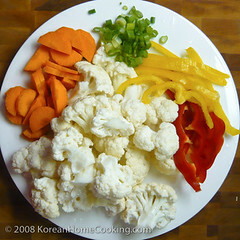 The mom told me that when she first saw cauliflower for the first time in a grocery market [in Korea] few years ago, all the moms in the store surrounded the cauliflower stand and discussed how they could cook this strange-looking vegetable for their family. I am sure they had a heated discussion. This recipe was one of the winners. I particularly like this dish because it requires the least amount of seasoning and is true to the ingredient's original flavor. Prepare vegetables and set aside. 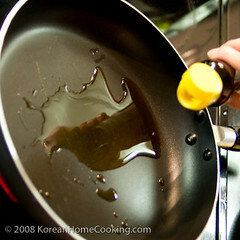 Oil the pan with olive oil or sesame oil. 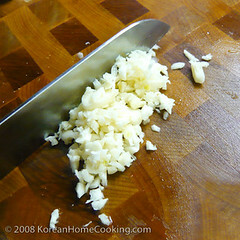 Add the minced garlic first and stir fry until golden, and add the remaining vegetables. 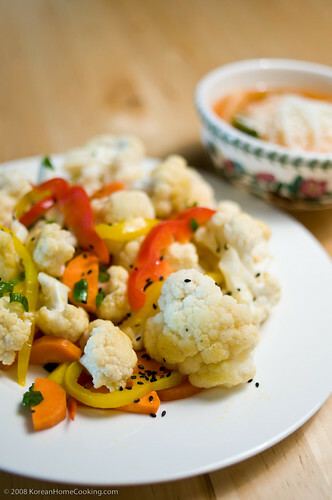 Season the vegetables with salt and a little bit of sesame oil. Sprinkle with black sesame seeds before serving. Great recipe! Actually, I made this earlier because I can't wait to eat this. And after I cooked this recipe the taste of it is very fantastic! I will definitely make this again and I will also add this to my cook book.